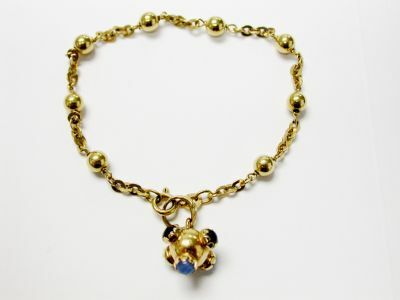 A beautiful vintage 18kt yellow gold charm bracelet featuring a charm with 1 round cabochon light purple chalcedony, est. 0.28ct; 2 round cabcohon deep green glass (paste), est. 4.0mm and 2 round cabochon deep red glass (paste), est 4.0mm. The bracelet is approx. 7 inches (18.48cm) in length.